"The Art and Science of Astro-Imaging: Bringing the Universe Dramatically Closer"
Sandra Faber is a University Professor at the University of California, Santa Cruz, and a staff member of UCO/Lick Observatory. She is an observational astronomer with research interests in cosmology and galaxy formation. Some of her major discoveries include the first structural scaling law for galaxies (called the Faber-Jackson relation), large-scale flow perturbations in the expansion of the Universe caused by superclusters of galaxies, and black holes at the centers of galaxies. In 1984, she and three colleagues presented the first detailed treatment of galaxy formation based on “cold dark matter,” which has since become the standard paradigm for galaxy and cluster formation in the Universe. Faber was one of three astronomers who diagnosed the optical flaw in the Hubble Space Telescope, and she played a major role in its repair. She established the scientific case for the twin Keck 10 m telescopes, which inspired a subsequent wave of giant optical telescope building all over the world. 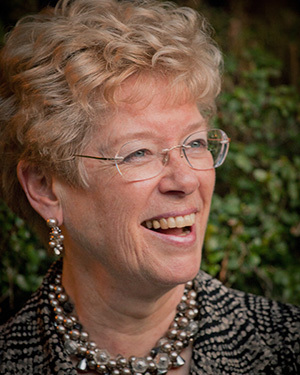 From 1994-2005 she was Principal Investigator of the DEIMOS spectrograph, a large optical multi-object spectrograph for the Keck II telescope that is the most powerful instrument of its kind in the world. She and colleagues used DEIMOS to conduct the DEEP redshift survey of the distant Universe, which collected spectra of 50,000 distant galaxies and exploited the immense power of Keck to see and study galaxy formation 10 billion years back in time. She now co-leads the CANDELS project, the largest project in the history of the Hubble Space Telescope, to extend our view of galaxy formation back nearly to the Big Bang. She has co-authored over 300 scientific papers, and her work has been cited over 46,000 times. Faber received her BA degree in Physics from Swarthmore College and her PhD in Astronomy from Harvard. She is a member of the U.S. National Academy of Sciences, the American Academy of Arts and Sciences, and the American Philosophical Society and is a Fellow of the Royal Astronomical Society. 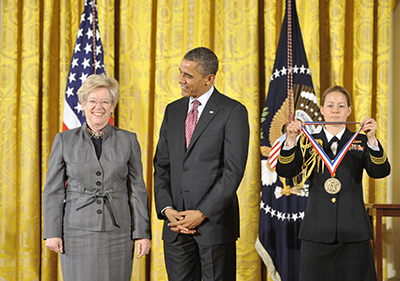 Among her many awards, she received the National Medal of Science from President Obama in February 2013. Faber will draw on her experience in astronomical optics and telescopes to illustrate the art and science of astronomical imaging, how it is yielding ever sharper images, and drawing the cosmos ever closer. Her talk will feature beautiful images and videos from Hubble, from the Keck telescopes, and expected fabulous images from the Thirty-Meter Telescope, a project of the University of California, Caltech, and four other countries.